At a university as beautiful and opportunity-filled as UCLA, it would be easy to put aside the harsh realities of the world. Of course, UCLA wouldn’t be a paragon of civic-mindedness and service if this were the case; students across campus invested time and energy into their communities and the world as a whole, and none more so than Ajwang Rading. For Rading, struggle was not just an abstract concept but a reality, something that defined his own values and aspirations and that shaped him into an inspiring global citizen. It is only under pressure that diamonds are formed, and after four years of tireless devotion to the university and people around the world, Rading proved himself to be a true gem. Raised by a single Kenyan mother, Rading came to know the struggle of poverty from his youth because of a series of unfortunate events, including the loss of his father shortly after birth. 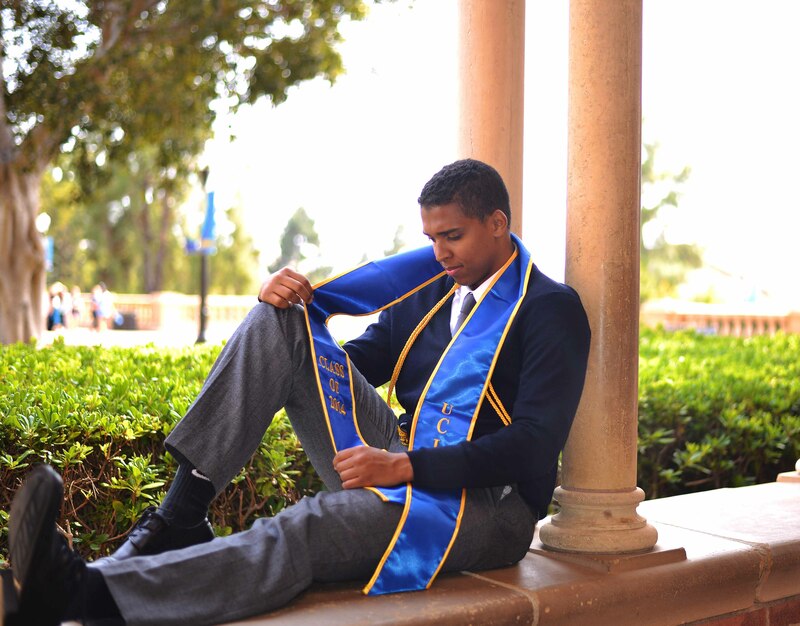 Although he and his mother eventually settled in Newport Beach, Rading felt acutely different from his peers at Corona del Mar High School. “My mother and I decided early on that education was going to be the most powerful tool to redefine our lives. In order to get to college, we needed access to a good high school andendured through a chapter of encompassing affluence to receive quality education, even though I didn’t share any of the community’s common denominators of wealth”he shared. 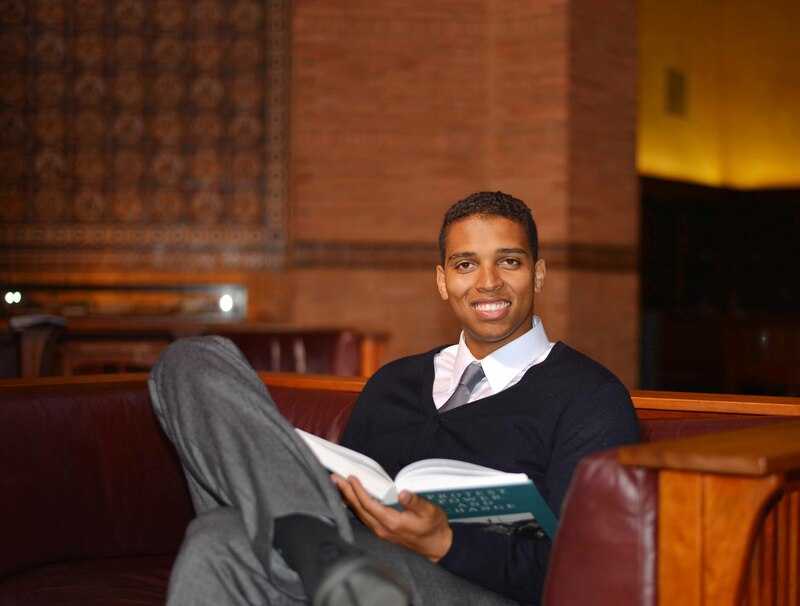 Rading was also the only black student at his high school, developing a gift to build personal connections with those of all socioeconomic backgrounds. However, Rading never let his differences isolate him from his school and he served as class president nearly every year, ingraining himself into his community. This upbringing, although far from easy, was something Rading expressed a deep appreciation for; “the adversities my mother and I have overcome have truly defined my purpose and aspirations in life. It is because of her, I have been motivated to pursue the responsibility to empower other’s lives, which has subsequently created an intrinsic pursuit of service, empathy and justice to answer the struggles I know too well”. It was at UCLA that Rading pushed his aspirations for global service sky-high: in his four years, he researched sectarian conflict and socio-economic policy at the Clinton Peace Centre in Northern Ireland, and later served as a youth advisor to its international summer school.Moreover, Rading shadowed former Secretary of State Hillary Clinton as the only undergraduate student at the Organization for Security and Co-Operation in Europe, even providing commentary on BBC about United States foreign policy during the G8 Summit there. Additionally, Rading dedicated himself to academia, completing honors research on “Politics, Ethics, The Law and its Morality” under Vice Provost of Student Honors, Dr. G. Jennifer Wilson. Diligently, Rading also found time to participate in student government, as USAC’s Director of Visibility and Outreach and Director of Campus Unity. Perhaps most important of Rading’s projects and contributions at UCLA was his vision, founding and institutionalizing of “The UCLA Global Citizens Fellowship”, the first global service initiative of the UC system. “I had aspirations to explore the world, learn from its living history, meet its people and empower their stories… on the one hand, the parochial life that I once believed defined my life and which I longed to escape, in fact instilled a deep purpose within me to empower those who too, had a vision for something greater than themselves.” he said. After a fruitless search for a purely global-service-focused program at the university level, Rading took the initiative himself, despite many obstacles in his path. If not for Rading’s shining motivation to serve others and overcome the odds, a generation of global citizens and their dreams may have never been realized. “The process was as tedious as it was blessed,” he shared with a laugh. “It took months of denial, knocking on doors, and professors giving empty gestures of hope and advice.” Eventually, Rading turned to one of his mentors, Vice Chancellor of Student Affairs Janina Montero, who took him and the promising Global Citizens Fellowship under her wing. About fifteen draft proposals later, Montero pledged a portion of her budget to the Fellowship, inaugurating it as an official UCLA fellowship program. Rading went on to raise over $40,000 for the program, which by the summer of 2014 would send three students to complete service projects in Uganda, Ecuador and Zambia, growing each year. Although he was a graduate, Rading would continue to serve an active role on the Global Citizens Fellowship— ensuring it and his proud vision for global service would endure at UCLA for generations to come. 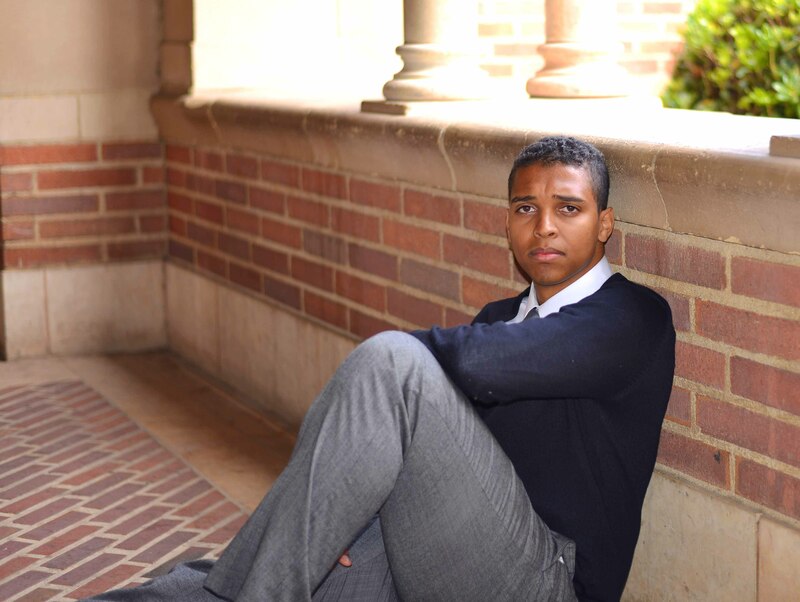 After leaving UCLA, Rading planned to take part in a fellowship overseas called Humanity in Action, and later continue his aspiration for service, particularly focusing on issues associated with women’s rights, socioeconomic inequality and poverty. 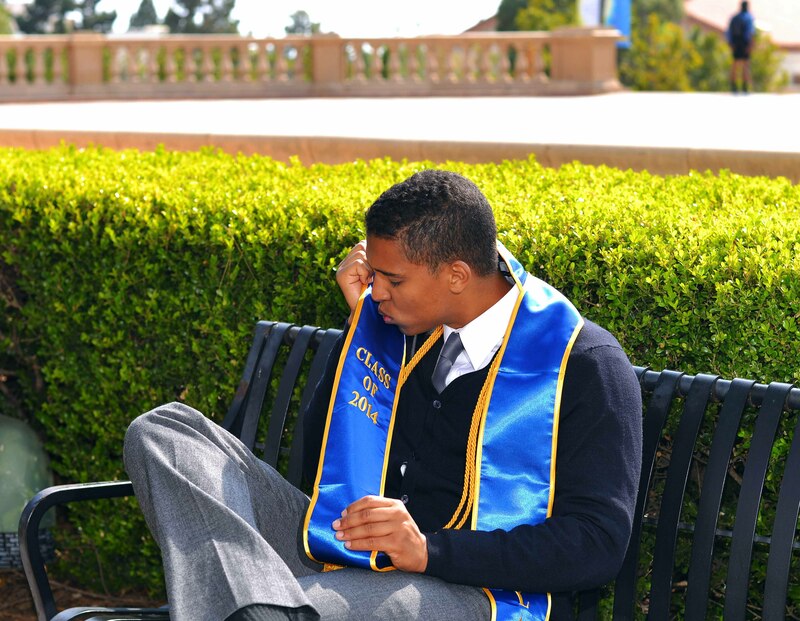 A true paragon of the community and a defining citizen of the world, Rading has left a legacy and philosophical footprint of service that has forever changed this university, making it, and of course his mother, unendingly proud to call him a true Bruin.